I filmed a great tutorial for you for today. Sadly, I had technical difficulties* with my new microphone and there is no Tuesday tutorial this week. I was able to piece together a behind-the-scenes look at the fun side of filming (with lousy audio from my secondary camera). It's a good thing he's cute. It's an even better thing that I had to scrap the entire video due to poor audio quality so this didn't matter at all. Did you know that the audio and video in that clip are from different cameras and I edited them together without looking like a badly dubbed Godzilla movie? Let's all take a second to be properly impressed. I film in my dining room and have wires running to the sewing machine, cameras, lights, and who knows what else. I may or may not trip over those wires when I stand up to stop the camera between takes. My middle name is not Grace. Since I work at home and all 24 hours of the day are mine, I film whenever I get a chance. This next clip was filmed just before 11pm. I'm off on a super-secret adventure today so I can't film a replacement tutorial for you. Maybe I'll have a chance to film again later this week. Re-watch all of my 2018 weekly tutorials while you wait! *I plugged it in incorrectly 'cause I'm smart like that. I'm trying something new this year -- starting a project and then staying with it until it is completed. Weird, right? Because you will ask: It's a Multi Clamshell ruler and a Steady Betty Band. Want to see how I did the quilting? Come back tomorrow where I plan to post a full tutorial on how to quilt this pumpkin seed design on a Crate Quilt. Time to find another quilt to finish! Should I be responsible and finish one already started? Or should I start something new and exciting? Or should I delay this decision by working on some postcards? Happy Tuesday! It's time for another Crate Quilt tutorial using the walking foot on your home machine! 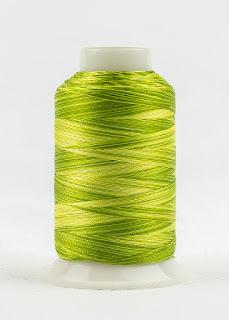 I used Paradise FabuLux thread in the needle, DecoBob in the bobbin, and Quilter's Dream Green batting (made from recycled soda pop bottles!). I am almost finished piecing wheelchair quilt for a senior at church and I just might use this pattern to quilt it. Last year, I decided to be honest with you about my rare autoimmune disease. To continue with that honesty, I must admit that I'm having a lousy week. I had another infusion on Tuesday and since then I've been asleep all but about 8 hours and didn't enjoy those 8 hours at all. Yesterday was rather awful; I was either unconscious or miserable and weepy. Then I got a package in the mail and everything changed. Lucy Fazely is THE BEST! I first met her when she interviewed me for a magazine article and she's been nothing but kind to me ever since, sending periodic treats through the mail. I have no idea what I've done to inspire such generosity on her part but her package yesterday was truly heaven-sent. She made me a tote bag! I burst out in tears, happy ones, when I saw it. It took a while for me to notice that the gift didn't end there. It was FULL of love! Thank you a million times over, Lucy, for brightening an incredibly dark day. I hope the darkest days of this round of infusions are over but even if they aren't, love from my quilting friends will carry me through. Have you made a Crate Quilt for a shelter animal yet? Hopefully this week's tutorial has you jumping into your scrap pile so you can practice making clamshells! My stack of Crate Quilts for the shelter is growing. Is yours? *1. Believe it or not, this cover photo was the best of the ones that they offered me. 2. I have no idea why this 12 minute video is over an hour long. Please don't watch a blank screen for an hour! I was away all of last week with my Handi Quilter buddies. We looked at quilts, talked about quilts, and made some wonderful memories and plans for the coming year. Yesterday, I chained myself to Errol because I missed him so much! At the end of the evening, I had a charity quilt for the veteran's home. The guidelines say 36"x42" and patriotic colors. I made my quilt from red, white, blue, black, gold, and brown fabrics. Who knew that my huge box of scrappy 2-1/2" squares only had 5 blue squares in it? It's small enough to easily baste on my kitchen table! I rolled the batting and top on old cardboard tubes to keep it contained while basting. I plan to chain myself to Hedwig today and machine quilt the day away. Which thread would you use? I think I like Midas Touch (it's my go-to thread on the left), but I also considered Blue Heaven (middle) to add the blue that this quilt is missing. I pulled out Mudpies (right) just because. Once you choose my thread for me, I plan to quilt it the same way I quilted the last Crate Quilt. I still have enough squares to make another veteran's quilt. I'll make that quilt the next time I'm in quilting withdrawal. I'm teaching at STITCHES United in Hartford, CT.
One of my greatest joys in life is teaching people to machine quilt. I see students in person in my classes and know that they take my Craftsy classes and watch my YouTube videos. I hope that my classes help, but nothing replaces practice. I know many quilters won't sit and practice machine quilting on practice pieces but would rather just get quilting. This year, I am suggesting that quilters make small crate quilts for animal shelters and practice their machine quilting while doing good! Raid your scraps, make a crate quilt, and practice using your walking foot. Sew together a few mini charm packs for a color co-ordinated crate quilt. Have you tried to quilt a quilt using your walking foot? You can quilt many different patterns using your walking foot, but start with this simple pattern if you've never tried it before. I have been playing with my walking foot on my home machine lately so I pulled out some In Bloom fabrics from Sandra Clemons (affiliate link*) and pieced a Share and Share Alike Cutie Quilt just so I could quilt it. That's perfectly normal, right? Lie to me. The orange butterflies on the pink fabric are insanely adorable and I need 18 bolts of this fabric! The pattern calls for fat eighths and border fabric, but I had fat quarters and yardage. I cut the blocks as instructed and pieced binding from the rest of the fat quarter pack. and started quilting my spiral. This thread color is my favorite neutral. Isn't lime green everyone's neutral? This quilt was given to a baby born during the hurricane. OK, 3 days after the hurricane but my story is better. The good news is that they can! The bad news is that this is a bedspread and I will have YEARS of evening handwork. It's stupidly cold in New York and I'm living in my basement in front of the woodstove, so my photographs are all dark. My apologies. I can't believe that someone bought me the perfect tote for this ridiculously old project, but I'm so glad they did. This will be perfect at home and for light hotel room sewing. *Affiliate link. If you purchase something through one of these links I may, at no additional cost to you, receive a small commission. Happy New Year! 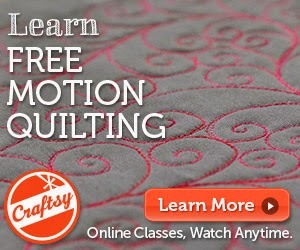 I'm so excited to bring regular machine quilting videos back to you this year! 2018 is going to be a party, so I'm starting off with Happy Cakes! I'm out of touch for today and part of tomorrow with some icky medical treatments. Have a cupcake for me, if you get the chance. Leave a comment telling me what you want to see in future videos because this year is the year of VIDEO! I'm an organizing geek, so January 1 means that I am over-the-moon excited for a NEW BULLET JOURNAL!!! I am giddy -- GIDDY, I tell you -- because I get to start writing in my new Miquelrius journal* today. The book Dot Journaling* has a lot of ideas about how to set up your journal. It focuses on the "diary" aspect of the journal in addition to the calendar, lists, and quilts that I talked about. If you have 27 years to spare, search Pinterest for Bullet Journal ideas. Some people go totally "arty" with their journals. I will eventually add some color to mine, but it will NEVER be as beautiful as the ones I see on Pinterest. Mine is completely functional, and that is good enough for me. Do you have a new calendar/bullet journal for this year? Please recommend some pens that these arthritic hands can use and love! *Affiliate link. If you purchase through one of these links I may, at no additional cost to you, receive a small commission.